Last week, I covered my day at Epcot. 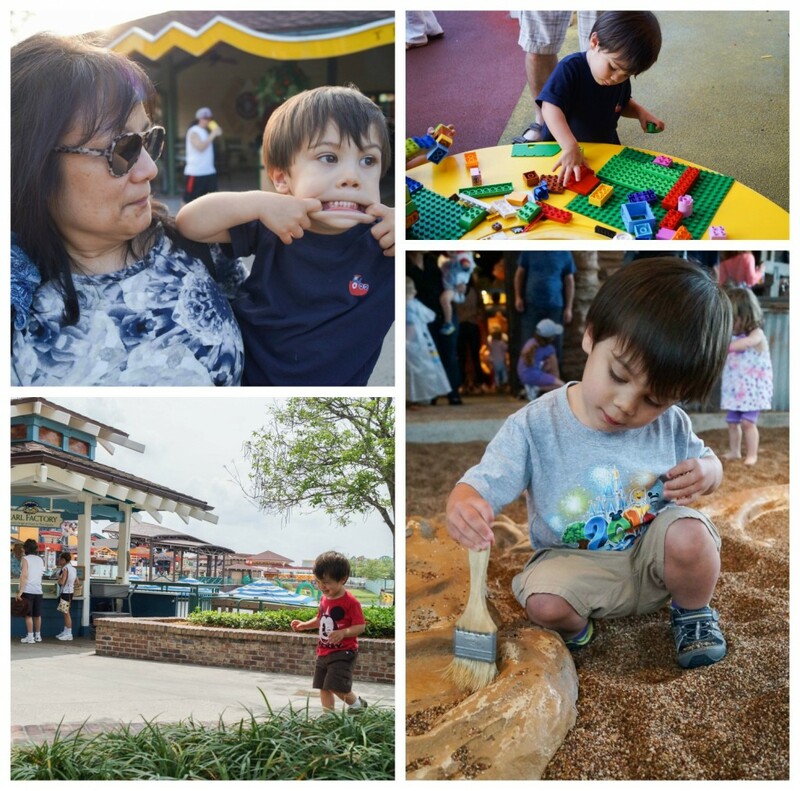 This week, I am covering our few visits to Downtown Disney. We visited Downtown Disney for the first time during the week after Chad’s parents arrived for a quick bite to eat. We were all hungry and Wolfgang Puck Express was close to the bus stop. 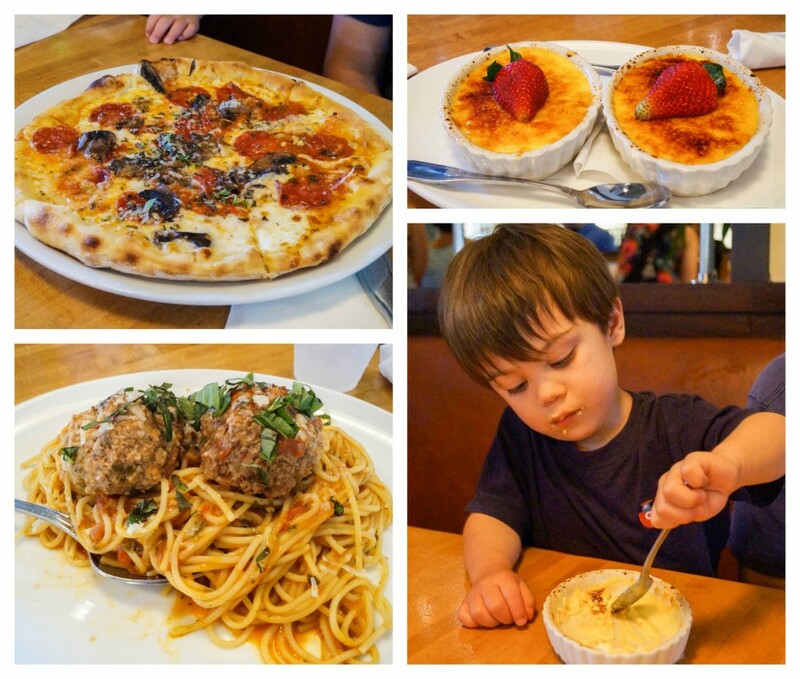 Chad, Evan, and I tried out Wolfgang Puck Express last year and loved it, so it was a fairly safe choice for the evening. Chad and his dad both ordered Pizzas, Pepperoni Mushroom and Cheese. Chad’s mom had the Rotisserie Chicken and I tried the Spaghetti and Meatballs. Evan shared bites from everyone’s plates and we ended the meal with Creme Brulee with Berries. Everything was delicious. I especially love that the restaurant is counter service, but waiters bring you the food and attend the tables during the meal. 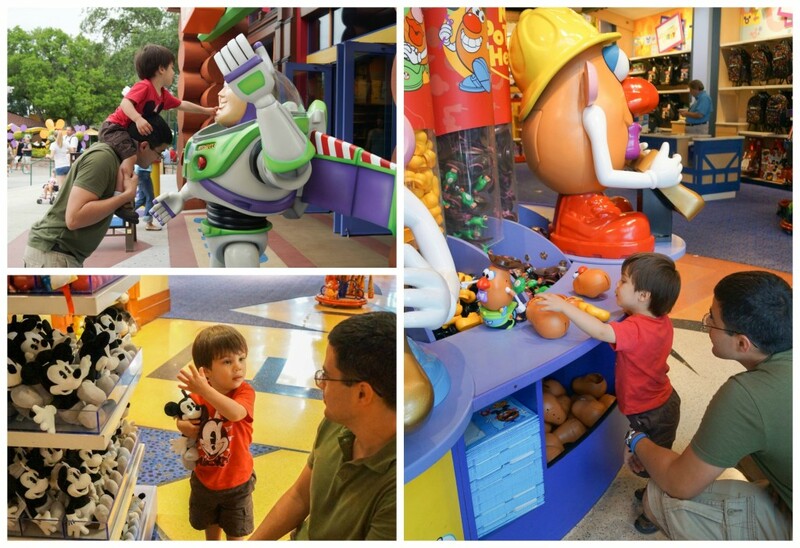 There were plenty of activities at Downtown Disney to keep Evan occupied. Evan hated being idle in the hotel room (he kept pulling on the doorknob while saying bye) and there seemed to always be thunderstorms in the area enough to close the pools, so it was a great way to kill some time when we had no other plans. The Lego Store had a duplo table set up outside at the perfect height for him. Even though we have plenty of legos at home, he could have spent hours here. He also loved just exploring the area. There is a digging area attached to the T-Rex restaurant that was also a hit. The Downtown Disney Food Trucks are a new addition since our last visit. 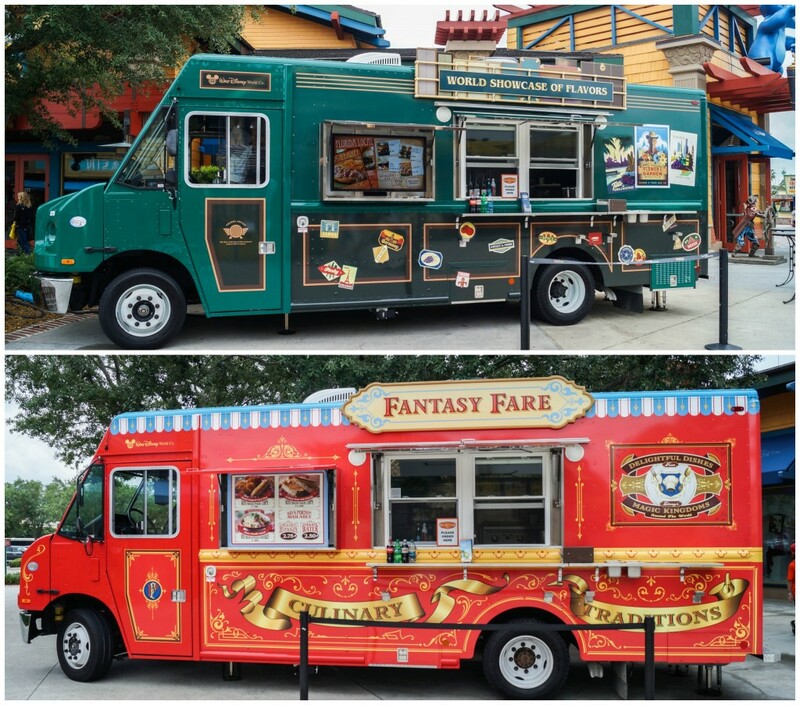 There are four food trucks located in Downtown Disney. We spotted Fantasy Fare and World Showcase of Flavors. The other two are Superstar Catering and Namaste Cafe. World Showcase of Flavors features food from the Epcot International Food and Wine Festival. The menu includes the Lobster Roll, Pierogies, and Grass Fed Beef Sliders. Fantasy Fare features menu items from Magic Kingdoms around the world: Hand-Dipped Corn Dog, Glass Noodle Salad, and Croque Monsieur. Superstar Catering features food from Hollywood Studios: Lamb Meatball Flatbread Sandwich, Turkey Sausage and Golden Raisin Meatballs, Spinach and Feta Meatball Sandwich, and a kid’s Beef Meatball Slider with Marinara and Provolone. Namaste Cafe features menu items from Animal Kingdom and Animal Kingdom Lodge: Slow-Cooked Beef Short Ribs, Tandoori Shrimp, and Butter Chicken. 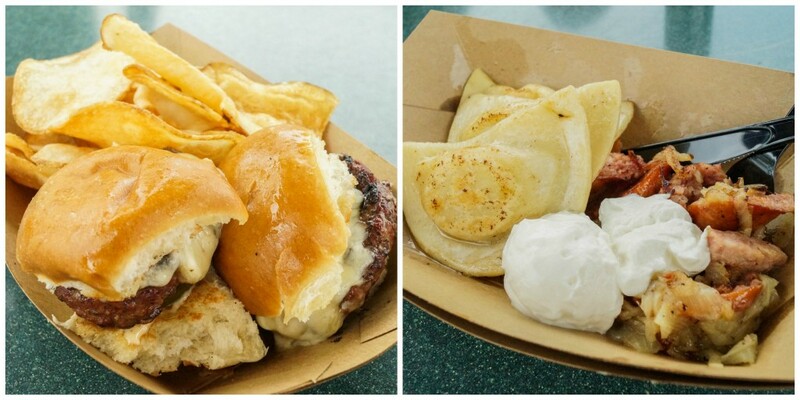 Chad and I both got items from the World Showcase of Flavors Food truck: the Grass-Fed Beef Sliders and Pierogi with Kielbasa and Caramelized Onions. Evan shared with us. Both items were delicious, but the prices were a bit steep for food trucks. 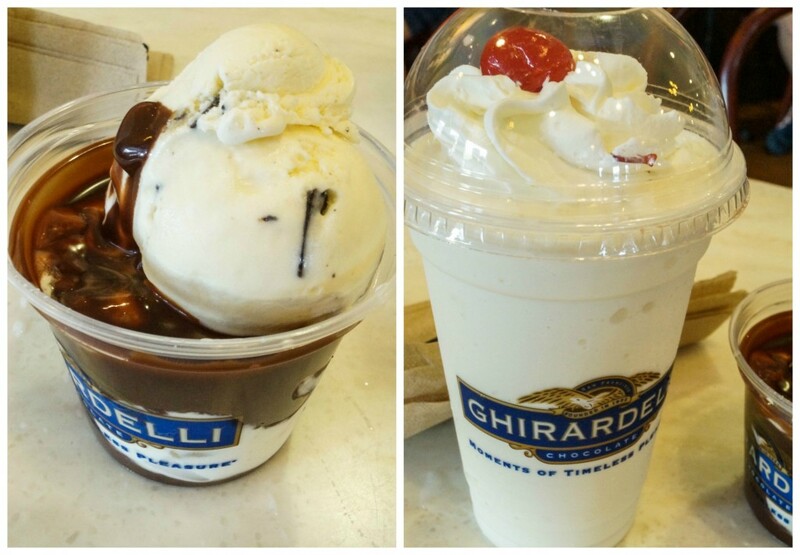 A couple hours after visiting the Food Trucks, we stopped by the Ghiradelli Ice Cream and Chocolate Shop for an afternoon treat. I got a Chocolate Chip Cookie Dough Sundae with Hot Fudge. Chad got a Vanilla Milkshake. If you have a large group, you can go for the Earthquake Family Favorite for 34.95. This includes 8 scoops of ice cream, 8 toppings, fresh bananas, whipped cream, chopped almonds, chocolate chips and cherries. 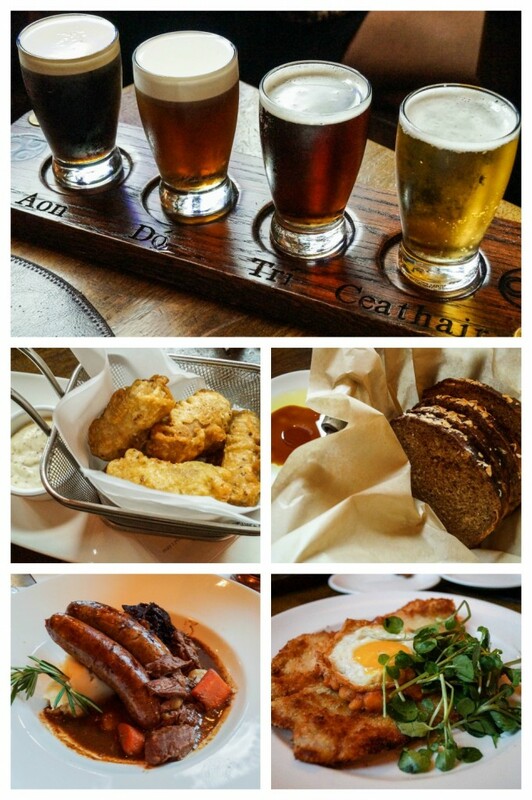 We visited Downtown Disney again at the end of the week with dinner reservations for Raglan Road Irish Pub and Restaurant. Chad started the dinner with a flight of beer The Four Provinces (Guinness, Smithwicks, Harp, Kilkenny) and I got the Dalky Duo (Battered Cocktail Sausages with a Dalkey Mustard Dipping Sauce). The bread was absolutely delicious. It was Brown Irish Soda Bread served with a Sweetened Guinness Reduction and Olive Oil. So addictive. I will definitely have to make the Guinness reduction for St. Patrick’s Day next year. I ordered the Bangers and Booz (Guinness & onion bangers on mash, topped with caramelized onions and beef stew) and Chad got the Schnitzel Savvy (Breaded and seared ham schnitzel with smoked bacon baked beans, a fried egg, and chips). Evan shared everything with us, but his favorites were the sausages, bread, and schnitzel. 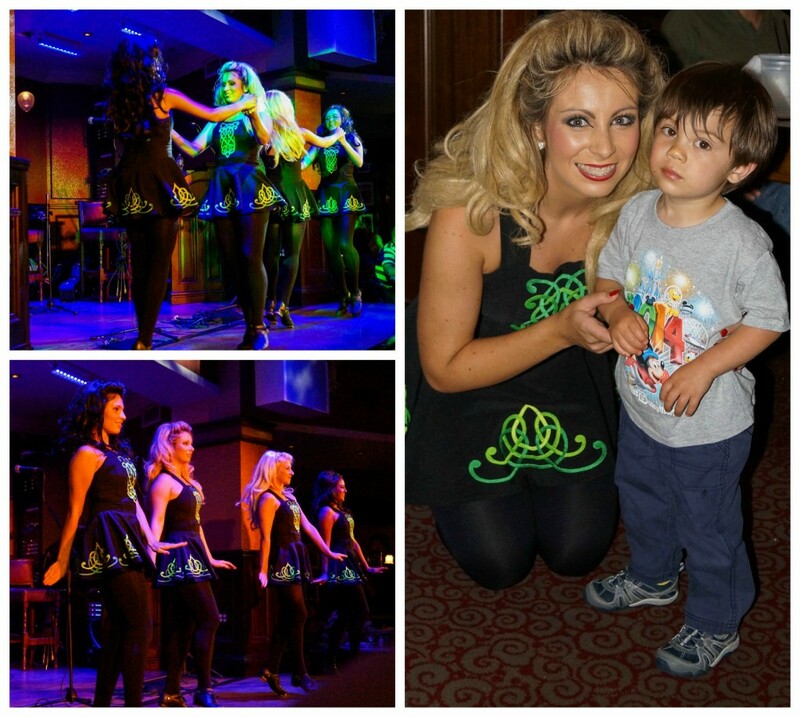 Throughout the dinner, there was live music on stage and Irish dancers. We were in a separate room from the stage, but the dancers came over and danced right next to our table. They even brought Evan out to join. He loved watching the dancing, but was a bit too shy to participate. I have always wanted to make Potato Pierogi and finally decided to after trying it from the World Showcase of Flavors Food Truck. There is quite a bit of prep work involved, but the Pierogi can be made ahead of time and frozen. You can freeze them in a single layer on a parchment lined baking sheet before or after boiling. If you are boiling frozen Pierogi, the cooking time needs to be increased to about 8-10 minutes. If they are pre-boiled, the time in the skillet will be increased a bit to make sure the filling is heated through. Overall, they are not difficult to make, just time consuming. They pair perfectly with the caramelized onions and sliced kielbasa. Farmer’s cheese is popular in Eastern European cuisine. It is a fresh, soft white cheese. It is available in some specialty cheese sections in larger areas or Eastern European food markets. If you are unable to find it, you can make your own (on my bucket list!) or substitute with cottage cheese completely drained using a cheesecloth or Queso Fresco (make sure not too salty) in a pinch. In the bowl of a large food processor fitted with a dough blade or a large bowl, combine flour and salt. Slowly mix in egg, egg yolk, and oil. Slowly pour in water as it processes or you mix just until the dough comes together. On a lightly floured surface, knead dough until smooth. Wrap in plastic wrap and let sit for 15 minutes to 2 hours. In a large skillet, melt 4 tablespoons butter over medium low heat. Once melted, add the onions and sprinkle with salt. Cook, stirring occasionally, until softened and a deep golden brown, 15-20 minutes. Remove 1/4 cup from the mixture and finely chop. Place in a medium bowl and put the remainder of the onions on a plate and cover with foil or place in a low temperature oven to keep warm. Place the potato slices in a medium pot and add water until 1 inch above the slices. Sprinkle with the salt and bring to a boil. Once boiling, reduce heat to medium and cook until tender, 10-12 minutes. Completely drain. Process the potatoes into the bowl with the onions using a food mill or ricer. Mix in the cheddar, farmers cheese, butter, salt, and pepper until well combined. Allow to sit until slightly cooled. Line a large baking sheet or counter surface with parchment. Lightly flour a large work surface. Fill a small bowl with water and place next to work surface. Divide the rested dough into 2 equal pieces. Place one piece on work surface and the other rewrapped in plastic. Roll the dough into a thin circle, dusting with flour as needed to prevent sticking, until it is about 1/16th of an inch thick. Use a 3 inch wide circular biscuit cutter or the top of a glass to cut out circles. Gather up the scraps and add it to the covered piece of dough. Place 1 teaspoon of slightly cooled filling to the center of each circle. Moisten the edges of the circle with water and fold the circle in half over the filling to make a half moon shape, lightly pressing around the filling to remove any air pockets as you press down to seal the edges. If desired, use a fork to crimp around the edges. Place on prepared parchment in a single layer and repeat with remaining dough and filling. Bring a large pot of salted water to a boil. Add half of the pierogi and cook, stirring to separate, until the edges become tender, 5-6 minutes. Use a slotted spoon to remove to a colander to drain. Once the water is boiling again, repeat with remaining pierogi. In a large skillet, melt 2 tablespoons butter over medium high heat. Add enough pierogi to cover in a single layer and cook until golden on both sides. Remove to serving platter and cover with foil to keep warm. Repeat with remaining pierogi, adding more butter as needed. Once the pierogi are done, add the kielbasa slices and cook until heated through. Serve immediately with caramelized onions, sliced kielbasa, and sour cream. Yum! So my hubby has no idea what pierogies are, which blows my mind. I will definitely have to make these! These are great! I’d never had potato pierogi before these. I’ll have to add this flavor to our Christmas Eve pierogi menu. Hi Melanie! The onions are caramelized and used in the filling.